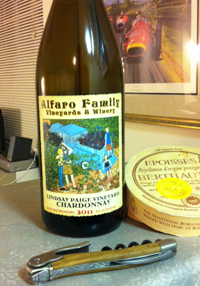 2011 Alfaro Family Vineyards, Chardonnay “Lindsay Paige Vineyard” Estate, Santa Cruz Mountains. This wine is one of the best kept secrets in Chardonnay in California, and is a fantastic value, truly one of my favorite Chards, year after year. Richard Alfaro grows some wonderful Chardonnay and his estate wines show just how good it can be, in fact other winemakers are now coming to him for fruit, like the talented crew at Arnot-Roberts which did an amazing Santa Cruz Chardonnay from Richard’s vines, which are planted to Wente and Dijon clones on slopes none to far from the Pacific near Corralitos and Aptos. The 2011 vintage was long and difficult with a tiny crop that needed attention 24/7, but in the end there was magic, and this beautiful detailed 13.5% Alcohol white shows vivid Burgundy like flavors and charms with chalky minerals, hints of smoke, brioche and layers of lemon, apple, pear and white peach fruit along with honeysuckle, hazelnuts and subtle oak shadings. This Chardonnay delivers bright acidity and steely coolness, but still fills out on the creamy palate gracefully and shines with a golden hue that is gorgeous.